Writing always begins with an idea, even if it’s significantly underdeveloped. If you transcribe words that communicate your concept, and dedicate time to making that message clear and dynamic, you eventually produce your final draft. Writing is a mystery that you solve along the way. Proofreading is generally considered the opposite of that. The belief that proofreading is a science isn’t terribly helpful for writers. Many writers become writers (not scientists) because they like to be artistic and creative rather than technical. There are special skills that you need to be a professional proofreader, but every writer can approach proofreading as an engaging activity that completes the writing process. Here are five ways to proofread that incorporate the fun aspects of writing. Great writing looks effortless, but it is laboriously crafted. Every stage of every draft—whether you’re copy editing or proofreading—is an opportunity to perfect your masterpiece. 2. Strive for the best. I separate the activity of writing into two parts: transcribing ideas and editing (completing sentences, refining sentences, adding punctuation, creating transitions, proofreading, etc.). Once you express your raw thoughts in a word processor, don’t consider your writing “done.” Create extraordinary works of art. 3. Get nerdy about words. 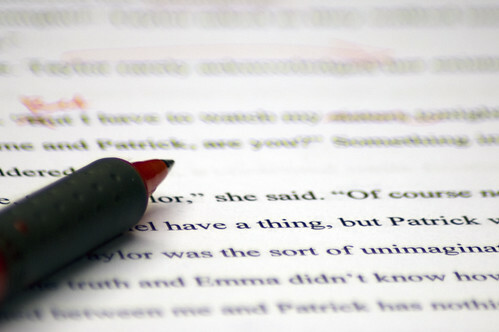 Review every word choice in your first few drafts. There may be more precise words or phrases that capture your intentions. 4. You don’t know anything. To develop your inner professional proofreader, you’ll assume the identity of a person who did not write your text. As you examine spelling, grammar, and syntax, make sure that a stranger would consider the content informative and clear. Look for new ideas when you carefully proofread each word. If you eliminate a tangent that is not appropriate for your current document, consider the topic for another piece of writing.